Classic Lost Land resort cabin with gas fireplace, custom wood doors, charming bedrooms and pine paneling throughout. Very clean, well maintained 4 season cabin at Birchwood Condo. Stroll private path to an open park with lots of room for the kids to play. Shared marina in a private lagoon protects your boat from the waves. 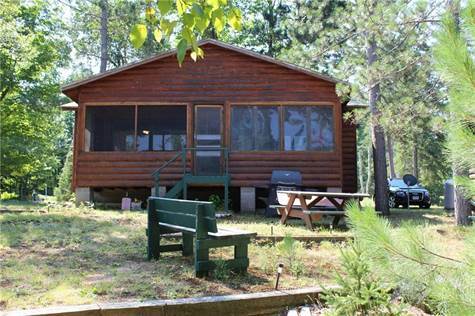 Lounge on your huge lakeside screen porch while you enjoy two lakes (Teal) for the price of one! This is a perfect setup for a first time cabin owner, or a retiring couple. Information is deemed to be correct but not guaranteed. All information should be verified.